Margaret Thatcher has died. She will be deeply missed. It _is_ in part an aggregate demand story — part of the story is that both consumption and investment expand beyond what possibly will be produced across time, and both production and consumption will contract, with consumption moving toward outputs with a shorter time horizon. Thanks for the comment Greg. I hoped you would comment on my post given your huge insight to the Hayekian story. I agree on the the demand side of the story. However, there is certainly a supply side story as well and that should lead to higher inflation in the bust phase. Would you agree on that? Would you be able to point my to Hayek commenting on this issue? I think the problem here Lars is that you start by talking in terms of “over” not “mal” investment. 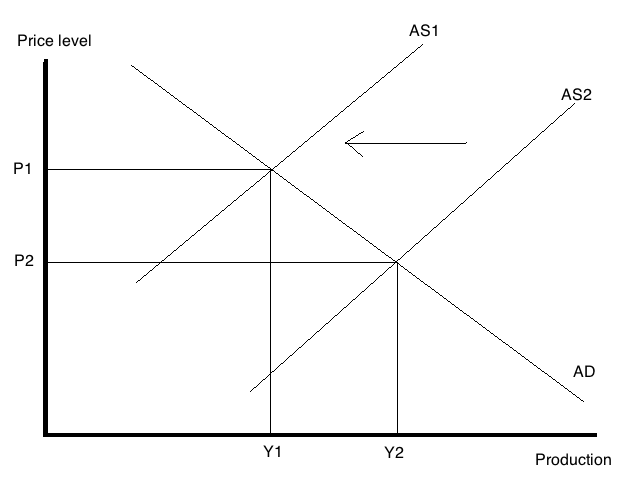 Portraying the Austrian cycle as an expansion of aggregate supply (and I think AS/AD can be useful for illustrating some basic macro stuff) requires that you think of total investment as having expanded to drive that AS curve to the right. However, when you think in terms of a structure of production argument, what’s happening is that we are diverting investment expenditures from stages of production closer to consumption to those stages more remote from consumption. The total amount of investment need not change and the AS curve need not shift. And as Roger Garrison points out, the false interest rate signal also discourages saving and encourages consumption by consumers. The Hayekian triangle is pulled at both ends, with more resources to earlier stages and more consumption expenditures, both of which come from the middle stages (and from household savings). For a short period, he argues, we exceed the PPF (if that’s understood as a *sustainable* level of production) as the increased spending at both ends is undertaken AS IF the PPF had expanded. That might well look more like a shift in AD than in AS. So whatever the benefits of AS/AD for capturing some basic stuff, I think it is cannot capture what’s happening in the world of the Hayekian triangle and Austrian capital structure, which in turn suggests that your story here might not be consistent with the theory. I always thought that AS is actually staying more or less the same. during boom – just changing “composition”. Mr. Horowitz, how do you see the “demand” part”? Somehow, I always thought that without some sort of “overshooting” – it wouldn”t be called a “boom”? Lars, I think you have some good points, but I also want to clarify some things too. I will refrain from being pedantic or criticizing your version of the ABCT; but I think it is worth mentioning the focus on relative prices and the role of money/bank credit in the cycle. The price of inputs will increase relative to outputs in the boom phase, even if the AS increases. Also, since it is caused by an increase in money, and we know that money increases affect the price level and NGDP, it seems hard to argue that the price level and the demand curve would remain unaffected by the monetary affects. I also don’t know if I’d consider resources idled by the business cycle a supply shock. But, that being said, I think you are correct in regards to the secondary deflation. I think you are a little off on the benign inflation part, or at least in its phase of the business cycle. I think the price inflation shows up not in the recession, but just before it. The investment that exceeded savings causes inputs like energy and commodities to spike and/or interest rates to rise. This is what makes the projects unprofitable. The problem is compounded by central banks that are inflation targeting tightening when they shouldn’t be! Central Banks do tend to err on the side of inflation, but when they get it wrong in either direction it really hurts. I agree with Steve. I would say the main problem pointed by Hayek is “how” goods are being produced, not “how much” of them are being produced. If I were to put ABCT in terms of AS/AD, I would think of structural changes “inside” AS (more than movements of AS) and eventually movements of AD. Of course, the problem is that structural changes “inside AS” cannot be shown in the AS/AD graph and this is where this tool falls short in this case. This may interest you: Hayek–Mises Theory as a Demand-Side One. Steve, Nicolas, Justin and Jon. You are all excellent economists and well-schooled in Austrian thinking. I am aware that I am not telling the right story about relative prices and the capital structure etc. However, I think I have a point. Lets forget about the boom and lets focus on the bust. In the bust in an ABCT model we basically have a natural disaster – part of the production capacity is blown up. Isn’t it so? And if that is correct then that is a negative supply shock. Hence, prices must increase in the bust. Anyway, lets have a vote – will prices in general increase or decrease during the bust in ABCT? ok…. I see what you are trying to deal with. The bust, however, can also see a collapse in money supply. That, plus stock sales to obtain liquidity, pushes prices down. If factors of production (ie labor) see their income dwindle because the project is not as profitable as was expected, if these resources are “fired”, then demand also falls. The supply problems have an effect on the demand side. If the value of supply falls, then how much can be demanded is affected as well. By a “collapse” in money supply I mean the outcome of firms being unable to service their debts to the financial sector. Lars a very interesting, and, for me at least, timely piece as I’ve recently been trying to wrap my head around ABCT. I have thought the same thing as you: that ABCT is a supply side story-clearly it’s real in that the productive capacities of the economy are damaged short term. I actually just came across this notion of “relative” inflation or deflation but you actually provided me some clarity on it. I just wrote a piece where I contrasted ABCT with Scott’s recent monetary primer posts. Both see the causes of the business cycle in more real than nominal terms. Certainly the prescriptions of ABCT couldn’t be more different than the Post Keynesains, some of the descrpition of how it happens is similar. I know that you and most of the Austrians too for certain, don’t have a high view of PKers, but that’s not the point I’m getting at. Rather in explaining the business cycle both see real vs. nominal causes of recessions. I’d also note that some major PKers actually started out as Austrains-Abba Lerner, et. al. Again my point isn’t to yet againlitigate the battle between these schools. When I speak of the “Left” and “Right” in economics converging I mean doing so over and against the “Center.” I think both Krugman and Sumner could reasonbly be placed closer to the Center. Both see the problems of the business cycle as more nominal than real. If you did a Venn diagram of economists that utilise AD-AS curves and those who buy into ABC I doubt there’s many in the middle. But I like the attempt to bridge them. I’m surprised that you’re not using the Cowen/Tabarrok version because that seems to be more friendly to a market monetarist view. It also makes it more clear that AD shifts play a part in the Austrian story. 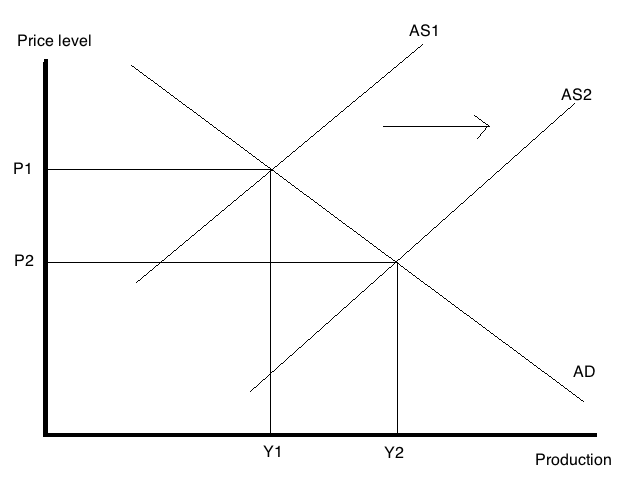 I think there’s a danger that because some Austrian economists deny the conceptual validity of “Aggregate Demand” that they imply that shifts in the AS curve tell the whole story. I think this is a straw man though. Another point about the Cowen/Tabarrok version is that the SRAS curve draws in money illusion. This reinforces the idea that for the boom phase at least it’s possible to view it as a movement along an AS curve rather than a shift in it (I think your analysis would be strengthened with a clear distinction between SRAS and the underlying potential growth rate). For what it’s worth I find the Cowen/Tabarrok version a useful way to see recent events, but I’d point out that the stylised facts aren’t necessarily deflationary – in the UK at least CPI has been consistently well above target. As you say, if this is a result of a negative supply shock then it isn’t necessarily an indication of loose monetary policy, and if you want to target NGDP then it’s not grounds to tighten. To answer your question, it depends on (at least) three things: (1) how long does the “spike” in consumer prices last? (2) is the secondary recession a permissible part of the ABC story (3) what’s the difference between the “bust” phase and the “recovery” phase of the cycle? If the “bust” is the inevitable consequence of the boom then it’s not determined by policy. Therefore if the secondary recession is cased by bad policy (e.g. allowing NGDP expectations to contract) then it’s not part of the bust phase. I’d call it part of the “recovery” phase (albeit not a good recovery). I concur that MV=PY is the best lens through which to view it. When I use AD-AS in class in relation to recent events, I show a negative AD shock *and* a negative shock to potential real GDP. Hence the present situation of below trend (but not necessarily below potential) growth, and above target inflation. I think that it was a mistake to allow NGDP to fall, but having made that mistake there’s only limited (and not necessarily desirable) gains in trying to increase it back to a previously unsustainable level. Thanks for posting this. I have an issue in general with, and maybe it’s a label problem, ideas that say things like people just have no way of understanding what they are doing if short term nominal rates differ in the short run. It seems contrary to free market philosophy that people would all of a sudden decide to buy a Ferrari instead of start a hardware business or put a kid through college, for example; and it leads, I think, to all kinds of misunderstanding about controlling the investment behavior of individuals instead of keeping a neutral monetary policy. The reason I appreciate this post so much is that the so called lessons of malinvestment or overinvestment haven’t really been learned in the U.S. Too many people would rather wait till some “lose” the game (bankers and borrowers) and then start all over again with the same board! First lesson: stabilize the board with an NGDP thought process . Second lesson: for God’s sake, start serving the portion of the market that couldn’t afford the original Luddite definition of (construction/building) in the first place, instead of blaming the “losers” and the governments/central banks that tie themselves itself into knots trying to stabilize what people insisted they wanted in the first place. Lars, ABCT does not predict that price inflation will always be higher during busts than it is during booms. During busts, Austrian theory explicitly recognizes that there are many competing and exacerbating factors that could make price inflation go up or down: For example the central bank’s response to recession, people’s new cash preference, and so on. Using AS/AD analysis to paint ABCT as a pure supply side only theory, is a flawed approach. Now I know that you said that Austrians would say this is the “wrong way” to look at it, but that doesn’t mean your correct prediction on this score means you’re justified in your approach. ABCT is not purely supply side, such that it holds the money supply and volume of spending constant throughout, such that it predicts higher prices during negative shocks to AS. ABCT deals with the structure of production, period. It does not make any statements with regards to the directions of aggregate price trends, no matter how much you want to shoehorn ABCT into a one-dimensional “supply side” column (the “evil/wrong column”). Price inflation is usually higher at the beginning of busts because, other things equal, fewer goods being produced leads to higher prices. This supply shock that you talk about is exactly what ABCT predicts and what we observe in the real world. Inflation did spike in the first half of 2008 for instance. The deflation that people associate with deeper recessions is a monetary effect that happens as a result of credit contraction. This typically happens after inflation rises and is usually what people associate with the “panic” phase. Here is the illustration of prices going up at the start of the bust before falling due to the inevitable credit contraction that takes place when banks realize they have made bad investments and must rebuild their balance sheets. Check out Bob Murphy’s article on this subject if you have time. Sorry for the double post. Austro-monetaristička teorija ciklusa? | Tko je John Galt?